Since the dawn of society, humans’ innate flair for invention has led numerous cultures around the world to develop the concept of Seinfeld completely of their own volition. Although the Seinfeld we know today may look entirely different, these four ancient civilizations independently created rudimentary versions of it that laid the foundation for modern Seinfeld. While it bears only a passing resemblance to Seinfeld as we understand it today, the Ancient Mesopotamian myths of Observant Jerry and his audience of deathless gods are largely considered to have laid the groundwork for all other Seinfelds that have surfaced throughout the history of Western civilization. Along with being responsible for world-changing inventions such as gunpowder and the compass, the Ancient Chinese also developed a relatively advanced Seinfeld of their own. 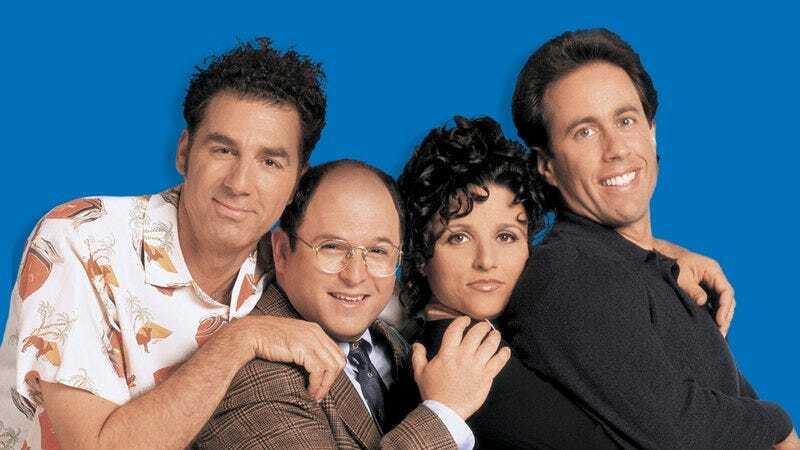 Han China’s first Seinfeld appeared during the Xia dynasty in 2070 B.C., though it should be noted that none of their characters interacted with each other because of their commitment to the Taoist virtue of silence. An additional variation of Han China’s Seinfeld was that every character behaved like Kramer, meaning each scene was just Elaine, George, Jerry, or Kramer bursting into their own Beijing apartment, frantically pacing for three minutes and getting offended when they ate their own food. Following the Mongol conquest of China, Genghis Khan put his most lasting mark on history with the introduction of Newman, a concept his military forces are believed to have taken from the folklore of the rural villages they’d ransacked along the path of their invasion. One important distinction that differentiates the Han dynasty concept of Newman from the Newman we know today is that in Ancient China, Newman wasn’t a mailman, but rather, both the father and the love interest of all four main characters in the Ancient Chinese Seinfeld. Archaeological studies have proven conclusively that the Ancient Egyptians not only developed their own version of Seinfeld, but that it was also incredibly ahead of its time, demonstrating both a complexity of story and grasp of quirky characters that was rivaled only by Larry David thousands of years later. Evidence suggests that the Egyptians developed a Kramer that was even more advanced than ours, and his depiction on pottery from this time shows him as a 14-foot-tall behemoth capable of bursting through the 12-ton stone door of Jerry’s massive palace. Unfortunately, much of the Seinfeld of Ancient Egypt was lost following the destruction of the Library of Alexandria, which is thought to have contained thousands of Seinfeld storylines and B-plots collected over countless centuries of Ancient Egyptian mythology. These works have been lost to time. While Ancient Rome did develop its own Seinfeld, it was completely off the mark. The Roman Seinfeld was centered almost entirely around George Costanza’s parents. In every episode of the Ancient Roman Seinfeld, George’s parents would argue with each other over whether their son, George, or his best friend, Jerry Seinfeld, was more attractive. In some episodes, George’s parents agreed that their son, George, was the most sexually pleasing, but in other episodes, they would agree that it was, in fact, George’s best friend, Jerry, who most aroused their lust. In Roman society, Seinfeld episodes would always be recited orally right before a public execution took place. The executioner would stand before the condemned prisoner while the Roman emperor looked on and said, “My Lord Emperor, in this episode, George’s parents decided that their son, George Costanza, was more attractive than his best friend, Jerry Seinfeld.” The emperor would then rise and exclaim, “What a misadventure!” The prisoner would then be beheaded as the crowd cheered. While our modern Seinfeld is certainly more sophisticated than the convoluted and morbid Seinfeld of Ancient Rome, this rudimentary version nevertheless laid the groundwork for the 20th-century Seinfeld that we enjoy today.